Best known as Mr. Sulu, helmsman of the Starship Enterprise and Captain of the Starship Excelsior, George Takei is beloved by millions as part of the command team that has taken audiences to new vistas of adventure in Star Trek, the unprecedented television and feature film phenomenon. When the entire Federation is threatened with starvation and dissolution, James T. Kirk - long believed dead - reunites with Spock to save a new generation from an awesome menace unleashed by a ruthless interplanetary conspiracy. Author William Shatner reads this riveting sequel to the New York Times best seller The Return! One of the most gripping - and personal - Star Trek stories ever told, The Ashes of Eden provides a new understanding of one of science fiction's greatest heroes - as written and read by William Shatner! 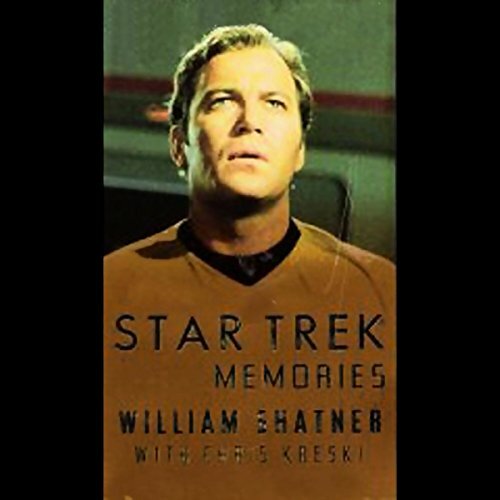 ©1993 William Shatner (P)1993 HarperCollins Publishers, Inc. This was very entertaining, I only wonder what photos I missed from the printed book. I must give credit to Shatner, he included at the end what the cast disliked about him personally, which is not a small part of the story, and that was essential, I think. A very entertaining read. Some bad language - be warned. Very interesting to get Mr. Shatner's view of these events. Even if you are not a fan of his, you learn a lot about Star Trek and filmmaking in general. The only downfall is that it is abridged. Shatner; Reads. His Own. Book. Yes. It's William Freakin' Shatner! What was one of the most memorable moments of Star Trek Memories? Listening to how one of the networks heard all of Gene Roddenberry's ideas about Star Trek. Passed on the idea. Then created Lost in Space from Gene's notes. If you're curious about Star Trek or are a major fan, this is an awesome book. What made the experience of listening to Star Trek Memories the most enjoyable? It is loaded with Trek trivia. Kreski really did a humongous amount of research for this book. Have you listened to any of William Shatner’s other performances before? How does this one compare? Yes, I have. This, like his narration of "Star Trek Movie Memories", feels rushed, as if he just wants to get through the reading. 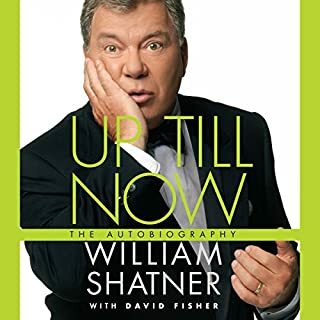 His "Up Till Now" was a much more enjoyable listen, and a lot more humorous a book to boot. Drawling & Drowning in Detail. It's a great source of details about the production of the Original Series, but you have to take it with a hefty grain of salt, because some of the stuff contradicts what Shatner has said or written before/after. For instance, he claims in this book that the controversial interracial kiss in the series never happened, while he's said many times before that it did. He also says that the actors frequently got together for barbecues and stuff off-camera, which is most certainly false. However, if you can look past the occasional fluff and misinformation, there is a great deal of interesting trivia here. 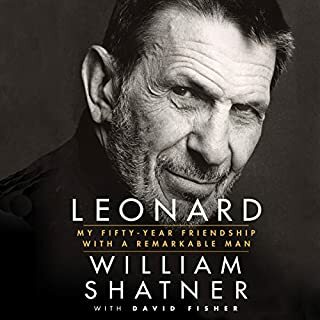 Great read--buy the book and skip Shatner's voice. Would you listen to Star Trek Memories again? Why? I would never listen to this again. Ever. You'd think that Shatner would breathe some emotion into these tales, since they're from his own life. You'd be wrong. I honestly can't tell you one of the most memorable moments. The audiobook version has ruined the good memories I have of reading the print copy. Shatner sounded less enthused than my college students reading about 5th-century Gregorian chant. I honestly wish I'd never listened to him read it. I wanted to be able to listen to it all in one sitting because of the stories but I couldn't do it because of Shatner's emotionless prattle. I'm a Trekkie through and through--my Uhura dress remains in my closet even though I outgrew it years ago. My starship blueprints are at my dad's house but my encyclopedia, TNG Companion, and TNG trading cards are all safe in my home. 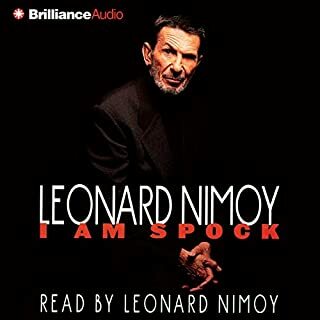 But I encourage anyone even remotely interested in Trek to avoid this audiobook. Buy the print version, read it in your own voice (or your fave Shatner voice), and enjoy the photos. Don't waste a dime on this version. I really liked the book, and Shatner has alot of good insights. But Shatner reads the book like he is performing, and so parts are almost inaudible because he lowers his voice at times to make a point. So recommend it on substance, but turn it up LOUD. 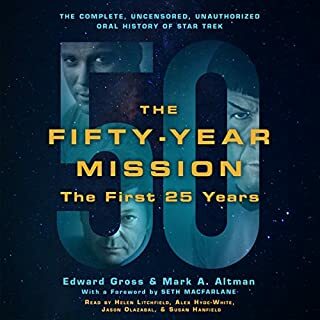 If you're a Star Trek fan, and even if you're not, this is a gripping listen. 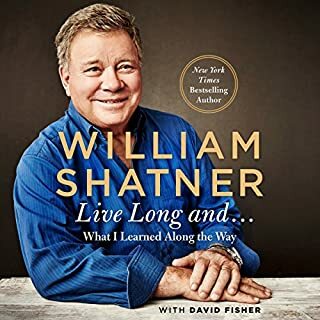 Shatner's read at times is a little fast (as though he's trying to get it all in within a certain time) but the fact that he's reading it, makes it worthwhile. Great stories and insight for the true fan, or anyone interested in '60s-era television. Shatner's reading seems rushed and oddly disinterested, but despite that it's still interesting and enjoyable. 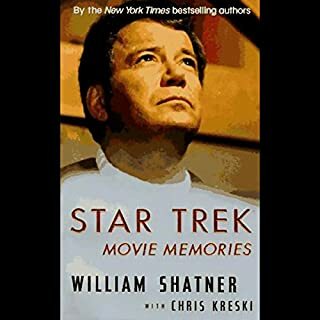 Not as entertaining as William Shatner's Movie Memories book but it was good. I take it the was the first of the two so the second one was a much more lively reading. I was a little embarked for some of the other cast members and crew he wrote sarcastically about but I understand that's just Bill's edge. He is trying to relay an important history for Star Trek fans in an honest way. All in all Shatner is a fantastic writer. He's not however shy when it comes to self praise. Interesting if you're a Treky no doubt. If they were interested in the origins of the tv series and the wider world of Star Trek. What does William Shatner bring to the story that you wouldn’t experience if you had only read the book? Hearing him reading his own book makes it more real to him as he's speaking his memories. Could you see Star Trek Memories being made into a movie or a TV series? Who would the stars be? I'm not a treky but was curious as to how the whole legacy began. Although I doubt I'd listen to it again, I'm glad I heard it once. Berry good book. Interesting facts and stories from the concept of the TV series to the end of the third season. Great for any Star Trek fan.